St. Telemachus was a monk who lived in the 4th century. He felt like God was telling him, “Go to Rome.” So He put all of his possessions in a sack (which for a 4th century monk was probably not much) and he set out for Rome. In Rome he found out that gladiators were fighting one another to the death in the Coliseum. He was amazed that four centuries after Christ this kind of thing could be going on – people killing each other in the name of entertainment. If I put myself in his place I’m not sure what I’d do. There were about 80,000 people watching the gladiators fight and loving it. (No doubt that many people in that crowd called themselves Christians.) I’d be horrified but I’d probably keep quiet and go about my business – get some pizza – hey I’m in Rome! Both the gladiators and the crowd were filled with rage and killed him. Stoning him to death. …But something changed – people’s eyes were opened to the sickness of what they were doing. That very night the Emperor Honorius got news of what had happened and banned gladiatorial contests forever. That was the last fight between gladiators in Rome. Innocent people were being put to death for the sake of the leisure of others. Sounds a lot like abortion doesn’t it? It also makes me think of the people living in poverty, working for pennies to make a few people rich. My friends – for evil and injustice to triumph in this world all that has to happen is for good people to keep their mouths shut and do nothing! Can little you stop all of the injustices and perversions in this world? Probably not alone. But out of the 6 billion people on this planet 1 billion are Catholics. That’s one out of every 6 people. What if every Catholic decided to just look out for 6 people? What if every Catholic, instead of saying “what can I do?” or “I don’t want to cause any controversy.” said “In the name of Christ, stop this thing.” to all of the evils and injustices we see in this world. Kingdom of God in this world! 1)	What strikes you the most about the story of Telemachus? 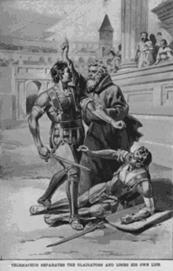 2)	If Telemachus were alive today, what are some things that might make him say “in the name of Christ stop this thing!”? 3)	What stops so many Catholics from taking a stand against those things? 4)	What stops you (fear of controversy? laziness? too busy?)? 5)	What are some injustices & seriously messed up things happening close to home (in your school/town/city/state)? 6)	What can YOU DO about one of those things? 7)	Challenge for the next week: DO IT!